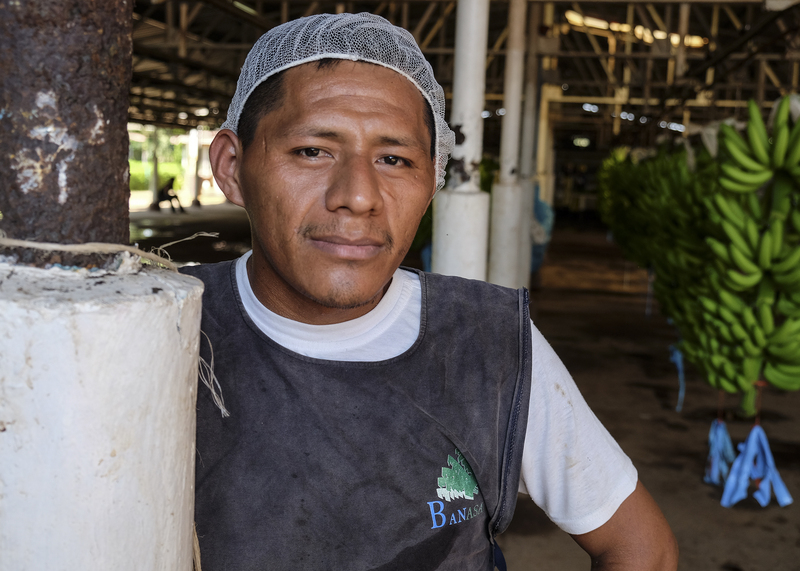 Every Monday through Saturday, 4,500 agriculture workers arrive at the Banasa Banana Plantation in Trifinio, Guatemala. These men and women wake up between two and three in the morning in order to reach the farm by five to start their shift. Most workers arrive by bus on a long, bumpy commute down windy dirt roads that lasts more than two hours. Others travel by bici (bicycle) or by foot, sweating and tired before they even start their day. They arrive to the plantation before the sun has risen. In the darkness of the night, they find their way to their designated posts. There are dozens of different roles for a banana plantation worker. There are positions in the fields to support every stage of the harvest: planters, pickers, fumigators, and protectors (who cover the bananas from wind and sun damage). Once the bananas ripen, the haulers bring the fruit from the field to the processing plant. 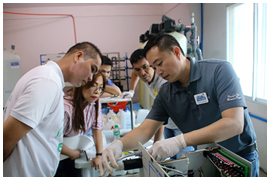 At the plant, there are people who wash, count, inspect, label, and pack the fruit. The job of the workers is monotonous, and I wonder how they endure their 10-plus hour shift. They move at rapid speeds, trying to complete as much work as possible driven by the fact that 10 percent of their wage is calculated by the hour while 90 percent is determined by productivity. They take their jobs seriously, being efficient yet cautious. They understand that they are easily replaceable. If a worker allows a damaged fruit to pass through their station three times, they will lose their job and their ability to put food on the family’s table. The temperature at the farm is brutally hot and humid with temperatures that soar above 100 degrees in the afternoon. The blazing sun and hungry mosquitoes seem to go unnoticed by the locals. Asi es la vida (this is life). The workers receive a short, 30-minute lunch break midday. No one asks to take any more time as lost time equals lost wages. They end their shift around five in the evening and begin their long commute home, usually not returning until after eight. They bathe with water from their shallow wells, eat and go to bed, trying to get at least six hours of sleep before they need to wake up and start their day all over again. Sunday is their day of rest, but the workers admit there is little time to relax. Carlos, a 36-year-old fumigator, says, “Sunday, I still wake up at three in the morning. I look for firewood. If I don’t find firewood, my wife can’t cook, and my family won’t eat for the rest of the week.” Carlos gestures towards the container with tortillas that his wife packed for him for lunch. Mariano has been working on the farm for over 16 years. Like so many of the other workers, he feels lucky to have the opportunity of a steady income. At 51 years old, he hopes he will continue working on the farm the rest of his life. Fewer women are employed at the plant, but the ones that are work side-by-side the men doing the same job, working just as fast as their counterparts. Matilde is a 34-year-old mother with four children between the ages of 11 and 16. Her 11-year-old died last year from what she believes was heart complications. She feels very fortunate to hold the position of a banana packer, a role that earns more income than many of the other jobs at the plant. She leaves her home at three-thirty in the morning and does not return until almost 11 at night. Her commute lasts three hours, and she works an 11-hour shift. She relies on her oldest daughter to take care of her children while she works. The hard work takes a toll on many of the workers. Fabian is 57 years old and has worked at the Banasa Farm for more than 10 years. He has never visited a health clinic and admits he knows very little about his health other than what he feels on any given day. He suffers from chronic back pain, but has never taken any medication for it. Fabian learned at the screening that he has stage four kidney disease. Erwin is a 26-year-old banana picker. For the past four years, he has spent nine hours a day in the hot, blazing sun in the banana fields. 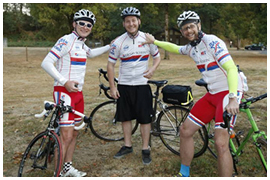 Erwin shared that he suffers from chronic back pain, itchiness, swollen legs, and frequent urination throughout the night. He has never been to a hospital or clinic. Erwin’s father passed away at age 46 from end-stage renal disease. Erwin found out that he too has stage five kidney disease. With failing kidneys, treatment is urgently needed. Still, Erwin fights through his pain working in the fields to earn a living. He is the man of the house now that his father is deceased. 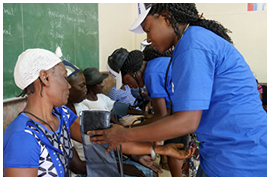 In partnership with CU Global Health this past February, Bridge of Life (BOL) traveled to Banasa Farm in Trifinio to screen almost 1,000 of the workers for chronic kidney disease as well as other non-communicable diseases. Our goal was to gain an understanding of the major health issues that affect the well-being of the banana plantation workers. 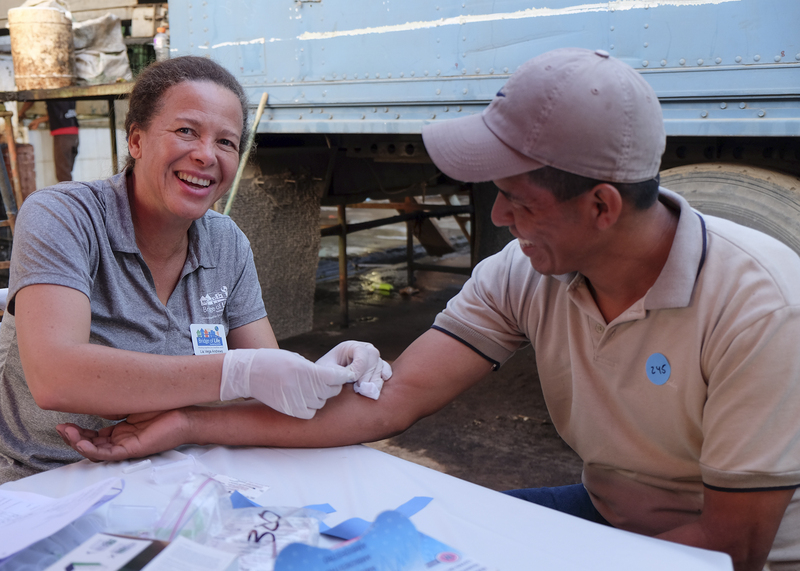 This mission was the first of many steps to improve the health of the workers, children and families living in the surrounding impoverished communities. BOL’s long-term plan is to develop an annual health screening of all the workers in partnership with the local health clinic, to train community nurses to educate the workers on disease prevention strategies and to increase access to healthcare services for people like Fabian and Erwin. Our team returned home from this life-changing mission in astonishment of the agriculture workers. We had never met a group of people that worked as determinedly in such harsh conditions day-in and day-out with absolutely no complaints. Our inspiration to continue on this journey comes from the steadfast commitment of these Guatemalan workers. They deserve more…and we can do more.